October Study Week was a busy time in the Equine Therapy Centre at Moulton College. An exciting collaboration with the Royal Veterinary College meant that a state-of-the-art piece of equipment could be borrowed and applied to horses for the first time whilst exercising on the College’s equine aqua-treadmill. 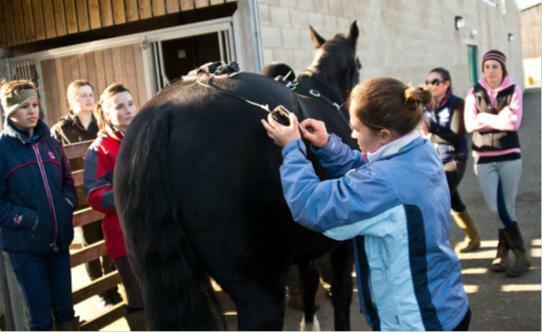 Dr Anna Walker applying the sensor system to “Dermot” while the third year Equine Degree students watch and get involved. This sophisticated piece of equipment is supplied by Xsens – a Netherlands based company. The system consists of eight tri-axial inertial sensors wired to a controller (Xbus Master). Each sensor is applied to anatomical landmarks on the horse’s axial skeleton. A wireless signal is then sent from the controller to a nearby laptop where the biomechanics of the horses’ movement can be recorded and processed. This system is being used to objectively compare horses’ locomotion overground with that on the equine aqua-treadmill at different depths of water in both walk and trot. “Bartie” on the Aqua-Treadmill modelling the Xsens system. Three days were allocated for data collection in the hope of maximising the sample size of horses. However, as the saying goes, “never work with children or animals,” things did not quite go to plan! 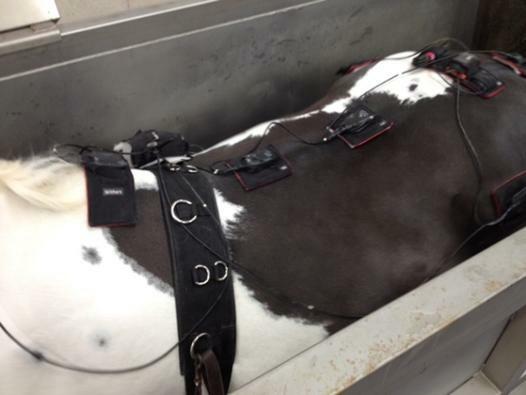 The sophisticated equipment was actually very user friendly and organised preparations meant that enough ‘sticky stuff’ had been cut to the right sizes to stick the sensors to the horses as it was imperative that the expensive sensors should not fall off and be damaged – particularly into the water in the aqua-treadmill! The general procedures of getting the kit on-and-off the horses got quicker as the processes became more familiar. Some of the third year equine degree students volunteered their own time to assist in the data collection to gain insight into this exciting research into equine biomechanics and into how they may need to plan their own data collections for their dissertations over the coming months. The extra help from these students proved invaluable. Special thanks must go to Emma-Jayne Millar, Eleyse Gottman and Kirsty Stroud. A lot of great quality data was collected from most horses. Some horses had to be withdrawn from the trial half way through as a precaution on welfare grounds as they were deemed to be struggling with the set exercise protocol. Although a little frustrating, as it was time costly to apply the kit to the horse to then only complete half the trial, this was an absolute priority in terms of safeguarding horse wellbeing and welfare. This is an inevitable aspect to be taken into consideration when conducting research with horses as they almost never behave as expected, and as such, a further date for the collection of more data is hoped for. The collected data will be processed and analysed, and the owners of the horses that took part in the trial will also be provided with a sophisticated breakdown of the gait analysis of their horse. This abundant data set will hopefully provide content for many articles and will form the bulk of a chapter of my PhD thesis. Image by Jessica York, submitted for the University of Northampton’s Images of Research Event. In addition to the busy month of October, an image was submitted to the University of Northampton’s “Images of Research” Event which has been displayed in the Avenue Art Gallery and the University Library on Park Campus, ultimately destined to reside in the corridor of the new Graduate School in Avenue Research Centre. Equine hydrotherapy research is ongoing and continues to be an exciting area of development with many more plans for data collection in a variety of areas. Posted on December 10, 2013, in Moulton College and tagged Aqua treadmill, equine, Hydrotherapy research, Moulton College. Bookmark the permalink. Leave a comment.